In this publication, edited by Eduardo Cadava and Aaron Levy, philosophers Judith Butler, Hélène Cixous, Avital Ronell, Gayatri Chakravorty Spivak, Hent de Vries, and Samuel Weber revisit the life and work of French-Algerian philosopher Jacques Derrida on the tenth anniversary of his death. Their recorded comments recognize his wide influence in the humanities and beyond. In addition, the publication also includes a booklet and audio recording from Jacques Derrida's seminar "Heidegger's Hand (Geschlecht II)" from 1985. 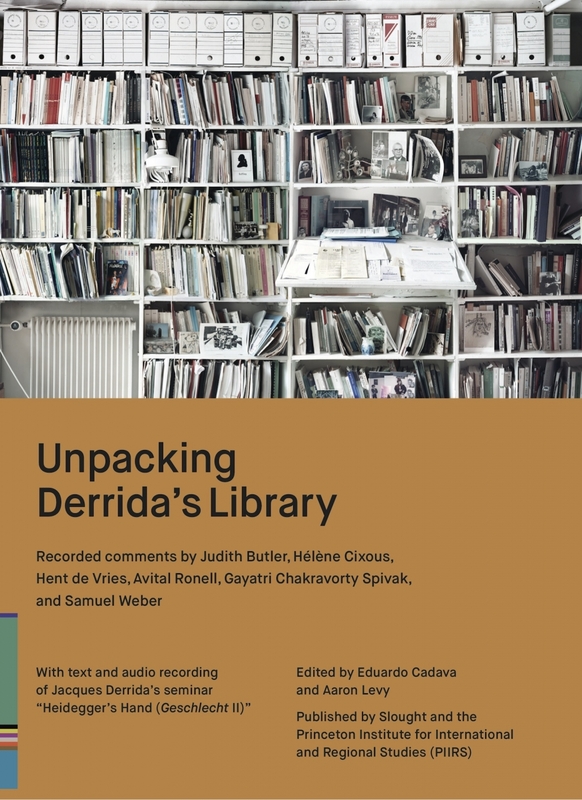 The title evokes Walter Benjamin's famous essay, "Unpacking My Library," since "Derrida's Library" can include everything his writings set down, laid down, deposited, stored, received, collected, gathered together, and read. His idea of the book exceeded what we typically consider a book to encompass, and included all forms of writing and inscription, and even the relations between texts and the historico-political domain. This publication provides an opportunity to think about Derrida's many legacies and everything we have inherited from him and his work. Published in conjunction with a symposium at Princeton University in October 2014.